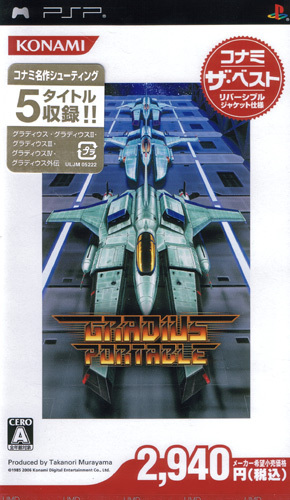 Actually contains five Gradius (or Nemesis) titles on the one UMD: parts one to four and Gradius Gaiden, representing excellent value with the precise pixels looking very snazzy against the black limitless backgrounds of space. 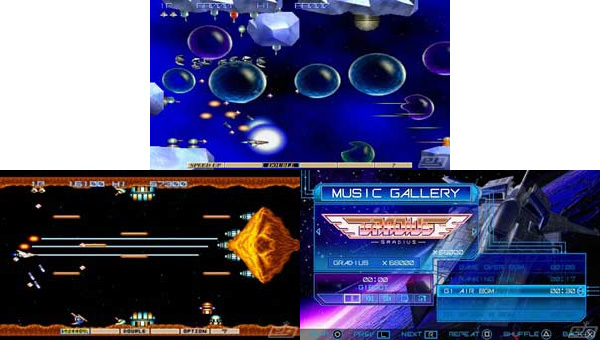 Gradius II was previously limited to the PC Engine in the best-known home conversion. 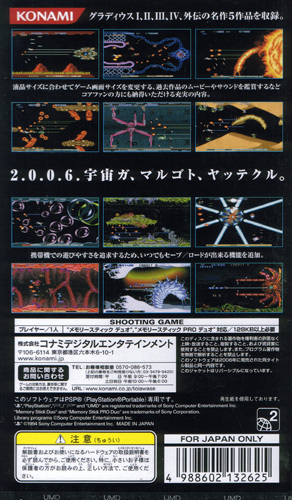 And whilst the SFC boasted a conversion of Gradius III, the PSP version here is actually far truer to the coin op. Gaiden was the first in the series to introduce polygon graphics to the equation and glides along effortlessly on the PSP. Refitted to the PSP's screen dimensions, the core game remains thankfully untouched but the cut scenes and sounds have been brought up to spec with the hardware. Plenty of extras in the gallery with movies and soundtracks to savour. Brand new. Konami the Best release.